Boxing Dreams, a new release on the Songlines label from Sean Noonan and his Brewed By Noon group, adds a few more tales to last year’s Stories To Tell, which introduced his vision of “wandering folk music” to many new fans. Once again the unique drummer/composer is providing listeners a chance to experience a fascinating fusion of influences, music that combines everything from jazz and rock to international folk music. The group is fairly sizable, consisting of Noonan and eight other performers, including guitarist Aram Bajakian, Irish vocalist Susan McKeown, and West African percussionist Abdoulaye Diabaté, who also performs some vocals. 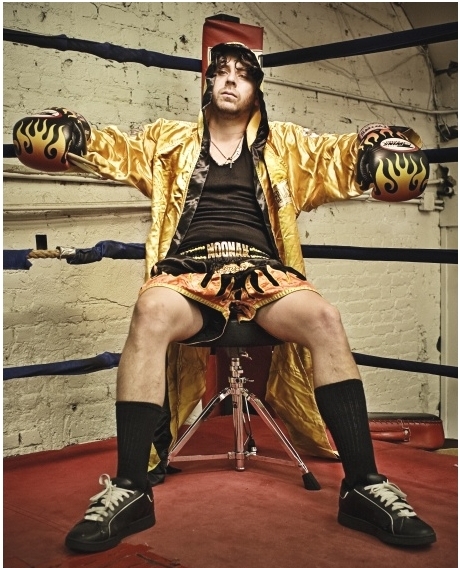 Although the title of the album (and the picture of Noonan) would seem to point to a pugilistic theme, that is not necessarily the case. As he says, “The main effect I wanted in Boxing Dreams was to give the impression that the entire album is a single boxed dream, where each song captures a different dreamed or imagined story.” But that being said, it’s also a tribute to his home town, Brockton, Massachusetts, which was also the home town of legendary boxer Rocky Marciano. But let’s talk about the music, which is – after all – why we’re here. It’s difficult to describe, but there’s little doubt that it is a wild ride through a constantly shifting musical landscape. The result is sometimes impressive and other times baffling, but it’s never boring. A good example is a piece named for the god of dreams, “Morpheus,” which encompasses fiery guitar, addictive percussion, and McKeown’s lilting voice singing lines from an Irish Gaelic dream poem. A startling, but strangely intoxicating combination. I was also intrigued by her vocal on “Look,” which was again based on historical lyrics, but ancient Gaelic isn’t the only language heard here. Given the international makeup of the group, it’s not surprising that several different languages show up from time to time, with the Mali-born Diabaté’s vocals on “Big Mouth,” especially of note. My favorite here was probably “Story of Jones,” which is intended as an instrumental narrative of the story of legendary (and tragic) trainman Casey Jones. Quite a leap for an song without lyrics, but it does feature some Impressive guitar work.